SHA is a popular hashing algorithm used by the majority of SSL certificates. As computing power has increased the feasibility of breaking the SHA1 hash has increased. Plans within the industry have been made to transition from SHA1 to SHA256 (SHA2). However with recent announcements from Microsoft and Google about depreciating support for SHA1 in browsers this transition has been accelerated. It is important to understand that this mainly affects browser based SSL certificates. Some applications and devices can only support SHA1 certificates. Please check with your software vendor/hardware provider how this affects specific equipment. However consideration should be given to ongoing security and the feasibility of cracking SHA1. Trusted root certificates using SHA1 are not affected. Clients trust them for identity purposes and not for the strength of their signature algorithm. Currently if your SSL certificate expires before 1 January 2016 then you do not need to re-issue your certificate unless you deem it necessary as part of your internal security. 26 September 2014 – Chrome 39: Sites with end-entity (“leaf”) certificates that expire on or after 1 January 2017, and which include a SHA1-based signature as part of the certificate chain, will be treated as “secure, but with minor errors”. 7 November 2014 – Chrome 40: Sites with end-entity certificates that expire between 1 June 2016 to 31 December 2016 (inclusive), and which include a SHA1-based signature as part of the certificate chain, will be treated as “secure, but with minor errors”. Sites with end-entity certificates that expire on or after 1 January 2017, and which include a SHA1-based signature as part of the certificate chain, will be treated as “neutral, lacking security”. Early 2015 – Chrome 41: Sites with end-entity certificates that expire between 1 January 2016 and 31 December 2016 (inclusive), and which include a SHA1-based signature as part of the certificate chain, will be treated as “secure, but with minor errors”. Sites with end-entity certificates that expire on or after 1 January 2017, and which include a SHA1-based signature as part of the certificate chain, will be treated as “affirmatively insecure”. Subresources from such domain will be treated as “active mixed content”. The current visual display for “affirmatively insecure” is a lock with a red X, and a red strike-through text treatment in the URL scheme. Certificates using SHA256 will require the installation of a new SHA256 Intermediate certificate. The intermediates are issued under a SHA1 root. This does not affect browser performance or the security as the end entity certificate is signed using a SHA256 intermediate. A root replacement program is taking place but this requires much greater planning by the browsers and CA’s. We advise hosting companies to consider pre-installing the SHA256 intermediates ready for customer reissues. We highly recommend using the SSL Server Test provided by Qualys SSL Labs to perform an in depth check of your certificate. The check will highlight if your certificate is using SHA1 or a SHA1 intermediate certificate. In most browsers you can also click on the padlock symbol to display the certificate information. Expand to show certificate details and check the Signature Algorithm. 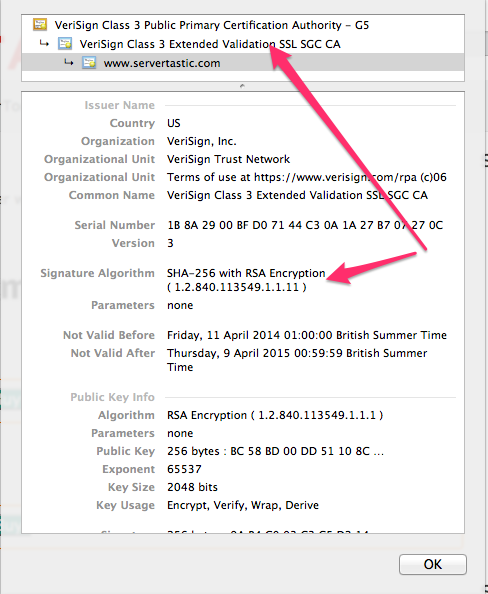 Also make sure you click on the intermediate certificate to check if this is SHA256. Once you have supplied this using the correct form linked below a time restricted link will be sent to you so you can review your order. You should then click Reissue in the left navigation. Please be aware that File and DNS authentication is currently not available for reissues. You will need to be able to validate your certificate using the Email Authentication option. Reissuing your certificate does not revoke the old certificate. You will need to do this after you have installed the reissue. Many older clients do not support SHA256. We maintain a SHA256 Compatibility page. Windows XP added SHA256 support in SP3. Users should upgrade to SP3. Android added SHA256 support in version 2.3. Earlier versions only support SHA1. If you have any helpful comments, suggestions or queries please share them in the comments below. For private issues Servertastic is available to provide support and advice. We also provide an installation service for $75.00. This includes the certificate generation and installation with most major control panels and servers. Contact us with details of your certificate and server system/control panel and we can advise further. The site is using outdated security settings that may prevent future versions of Chrome from being able to safely access it.